Fun wear is just that - garments that children can move in, jump in, run in and have fun in. Fun wear from Heirloom Treasures includes sundresses, hoodie sets, Capri sets, twirly skirts ......even rain gear. Garments are constructed using the finest cotton and poly cottons, prints, high quality knits and fleeces, top grade outwear fabrics that can be embellished with appliques or embroidery or sparkling crystals. Again, imagination is the only limitation. The photographs below are examples of the fabric/colour/embellishment combinations. Any garment depicted here can be made in your choice of fabric, print, colour and embellishment. This bright raincoat is sure to chase away the rainy day blues and keep your little one dry. Generously sized to allow comfortable wearing of heavier sweaters or tops underneath while leaving lots of room for jumping puddles. With a brimmed hood, silky cotton lining and a hanging loop, this raincoat is long enough to cover the tops of rain boots and keep pants dry. Constructed of the highest quality laminated cotton, lined in 100% cotton, with sturdy plastic snaps for easy dressing. Also available in the lady bug print pictured below. 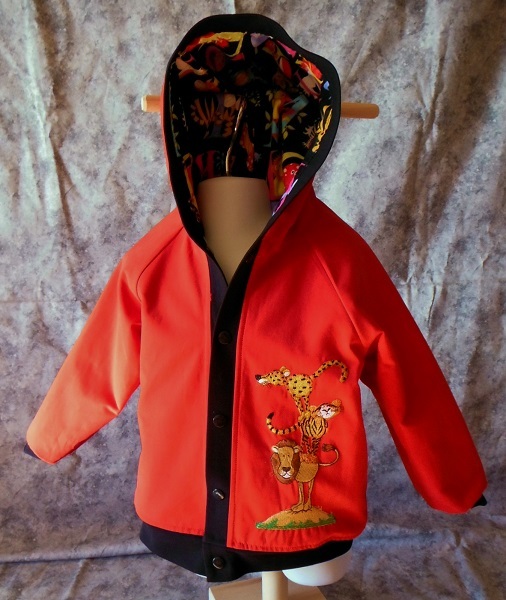 A great spring/fall hoodie jacket for your little man. This jacket is constructed using Canadian Mist fabric from Siltex. Canadian Mist has a DWR (“durable water repellent”) finish - this means that water will bead on the surface and not soak in. A cotton lining and an interlining of cozy flannel add warmth and keep out the chill of a spring or fall day. A full hood, ribbed cuffs and waistband and sturdy plastic snaps complete this jacket. A bright and playful embroidery on the jacket front adds the FUN factor. A simple change in the lining print and the embroidery make this a great jacket for a little girl too! Celebrate spring with this beautiful little coat. Based on the original design and pattern from FooFoo Threads, this classically styled ruffle back coat will be a new favourite with the little lady in your life. The sweet ruffles on the back and the oversized ruffled hood give this coat extra charm and girliness. The coat can also be made with a Peter Pan collar instead of the hood for a more classic look. The ties that come out of the sides of the bodice complete the coat and can be tied in front or in back, the choice is yours. We used a beautiful rich blue/purple Kona Bay cotton and whimsical lime green and aqua Bernatex prints in our coat for a bright, modern & fun look - however done in more pastel shades or traditional prints would create a beautiful classic princess look - again the choice is yours. The raincoat and the ruffle-back coat combined into one gorgeous creation! Using PUL (polyurethane laminate) instead of the normal laminated cotton, allows the coat to keep it's feminine ruffles and gathers while at the same time being waterproof. With all the styling of the original ruffle-back coat in a fun print with a contrast/coordinating lining and ruffles, this delicious raincoat clearly states "I'm a modern miss! ".